We arrived at our destination around 5pm where we were greeted by the friendly owner, Patrick. He suggested we walk around the building so we could get to know the place and introduce ourselves to the "spirits" until the two guides in his employment arrived to give us the official tour. During this time David's K2 meter hit red around one of the doorways. Not sure, but think that was room 5. At one point while we were being lead around the second floor, most of us heard a voice. It happened 2 or 3 times. A series of sounds were also heard at this time that one of the guides believed was the sound of ghostly footsteps; jury is still out on that one! We left the hotel just before dusk to briefly investigate the local cemetery. Bertha Gifford is buried there, along with some of her purported victims. 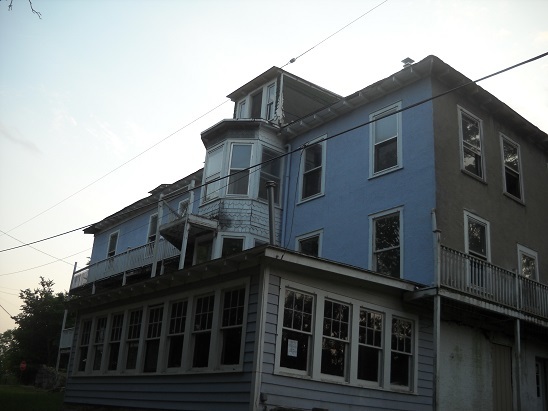 At the time we believed that she had a strong connection to the hotel, but based on investigation of historic records have since concluded it may not be so. A couple of soft EVPs were captured at the cemetery. Upon return to the hotel, the guides informed us it had been quite active! We went about setting up our equipment. Our team had also brought the house spirits some gifts, hoping these would appease them so that we would not be attacked, like some people have reported. As I was setting up one of our video cameras at the top of the stairs on the 2nd floor, I heard a very loud hissing noise behind me. Unfortunately, it was not captured on my digital recorder; however David and Trish heard the same thing later that evening, but they too were unable to determine the source. We experienced an interesting issue with this same video camera. It would go in and out of focus, at the same time it also captured what sounded like footsteps. We also captured a child's voice on that DVR, seemed like she was hanging out at the top of the staircase watching us as we were setting up the rest of our equipment. Later on another video camera, set up in the same location, we caught a distinct male voice. Our video recordings also had some interesting lights show up on them. A couple of times there appeared to be a flashlight from behind and to the side of the camera even though none of us was on the second floor. At another point, a series of lights, like from a camera flash appeared through the 2nd floor window of the end of the hall. At that time Zach and I were in the room by the attic stairs and David and Trish were walking to the bridge...or so I thought? Later that evening, as I stepped outside onto the back deck of the house with Trish, we both heard what sounded like a male and female in conversation that abruptly stopped. We did not find anyone outside. While sitting outside on the deck with Zach, I witnessed a couple of balls of light in a 2nd floor window, then within a few seconds in the window next to it. Those windows were two separate locked rooms, not sure but perhaps it was a reflection from car headlights? In the very early morning hours, Zach, while on the second floor said he heard a sneeze, and it was not any of us! Shortly after that, I also heard someone sneeze while I was sitting in the room at the bottom of staircase. Once again, it was not any of us and it was captured on my digital recorder. As far as personal experiences, I can't say with certainty whether I truly felt a touch while I was in the basement. Zach also wasn't certain whether or not his shirt was tugged while he was in the attic. At one point, I did see what I can only describe as a dark head-and-shoulders shadow during a flash of light in the room off of the parlor. It helped to solidify my experience when later that evening Zach described seeing something very similar sitting in the same spot. My favorite of all experiences was during our final walkthrough before packing up the gear. While I stepped into the corner room by the 2nd floor staircase, I thought I heard "Vicki", very loudly in my ear. After checking with fellow CAPS investigators I thought I had lost my mind from lack of sleep. To my great surprise, it was captured on my recorder. Not sure if it was my name, but it made me happy to know I'm not totally crazy!!! After I had stepped back into the room, I heard the voice again, but unfortunately, that time it didn't come across as clearly on the recording. 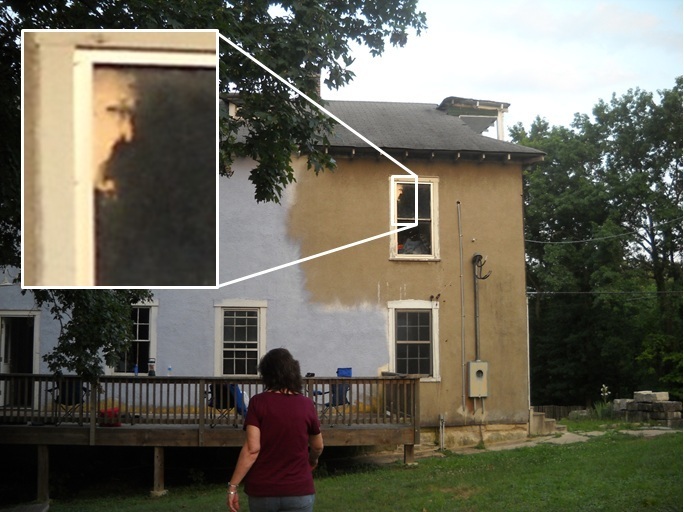 Looking back, the most active area during this investigation was on the 2nd floor. We captured a multitude of EVPs, there is a strong presence of a child...sounded like a little girl to me. We also recorded adult male and female voices, with possible names heard: Carl, Anna, and James. We had some interesting photos. In the one here, there is an interesting reflection in the window that was not in the photo taken just prior. Personally I see a facial profile, a bearded man with curly grey hair. I liked one of David's photos, too dark to tell, but I certainly see a shadow figure or two! I look forward to returning so we can further investigate the lights and photos.
" (Carl?) won't scare them"